TWIN FALLS, IDAHO — Recycling trucks will continue to collect mixed paper, plastic, and metal cans from this city’s 48,000 residents. But rather than finish their trips at the city’s recycling center, they’ll head straight to a transfer station where the items they carry will be tossed out with the rest of the trash. This new arrangement — which the city and its solid waste collection contractor, PSI Environmental Systems, worked out last month — hopes to keep an extremely popular program going until the international market for recyclable materials stabilizes and their processing costs go down. “This buys us some time,” Twin Falls Mayor Shawn Barigar said as he and other city council members worked this solution out over the course of three public meetings last month. Like most cities, Twin Falls saw the cost of its recycling program skyrocket when China announced it would no longer accept certain types of “foreign waste” including unsorted paper, low-grade plastics, and improperly cleaned recyclable materials. According to numbers collected by the Twin Falls Times News, PSI spent $16,500 on the city’s recycling program in January 2018 when the cost of processing recyclable materials was $65 per ton. That’s more than three times what it spent running the program in January 2017 when the cost was $35 per ton. With no end to these increases in sight, PSI Manager Jeff Brewster approached city officials at the end of February and asked if they’d be willing to split the cost of running Twin Falls’ recycling program or abandon it all together. Council members learned that cancelling the program wasn’t an option at their Mach 5 meeting when half a dozen city residents –including two members of a local high school environmental club – spoke about the virtues of the city’s recycling program and how they wouldn’t mind paying extra to keep it going. 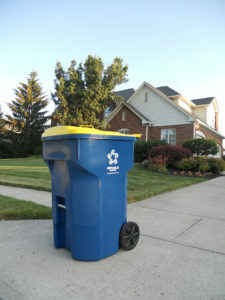 However, council members also didn’t want to place too great a burden on the city’s low- or fixed-income residents who could seriously be hurt if their garbage bills went up several dollars each month. They solved both problems by working out a cost sharing agreement that could easily be copied by other localities across the United States. Under the terms of the agreement, PSI would recycle the items it collected from Twin Falls residents so long as the costs of processing these items was less than $100 per ton – an amount the city and Brewster’s company would spilt 50-50. But if the cost was more than $100 per ton, the company would take the materials to the landfill and charge the city for any extra tipping fees it incurred. Council members approved a 53-cent increase to the city’s monthly utility bills to cover its part of the cost sharing payments at their March 12 meeting. They would have been forced to pass a 40-cent increase to cover the excess tipping fees they would have incurred if they cancelled the program. “If we ever stop we’ll probably never get started again,” Councilmember Greg Lanting said as he relayed news that several other localities had chosen to suspend or cancel their recycling programs all together. According to the Times-News, it cost $164 to process a ton of recycled materials last month so the first load of recyclable materials collected when the cost sharing agreement goes into effect will head straight to the landfill. This hasn’t stopped city officials from remaining hopeful about the program’s future and the chances what Barigar called “the heavy hand of economics” will help them find a more permanent solution. “Somebody’s going to figure out a way to make money off this,” he said.